This article explains the cause and several solutions to the BACKTRACK problem that prevents the client workstation from locating SQL database on launch. When the BACKTRACK client workstation (using SQL) opens, it attempts to connect to the SQL database. If it cannot, it will generate an error message. Solutions depend on the reason listed above. Need to enable and run the SQL Server service for that instance. This needs to be done on the computer/server running the SQL Server database. 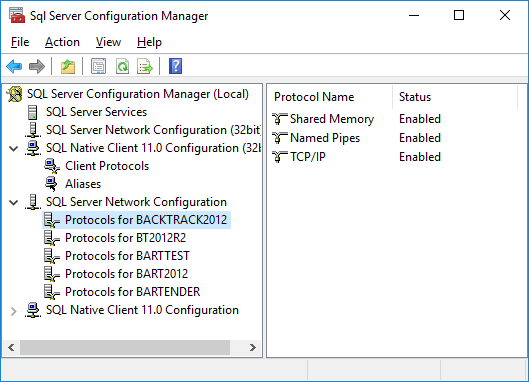 Protocols that control connections to SQL Server may need to be changed to allow BACKTRACK to connect. This can be done via SQL Configuration or SQL Management Studio. The settings must be changed on the computer/server running the SQL Server database. The btwdata.ini file my contain and invalid or incorrect name for the SQL Server. A common error is that the file contains “local” as the server name (e.g. using “(local)\<BACKTRACK SQL server instance name>” instead of “<Windows server name\BACKTRACK SQL server instance name>”) from the btwdata.ini file. If this is the problem, changing it to the actual server name or IP address will correct the problem.